Broom (Cytisus spp. ): growing, planting, caring. Scientific name : Cytisus spp. Brooms are shrubs from different generas - but all have long yellow-flowered arched stems. 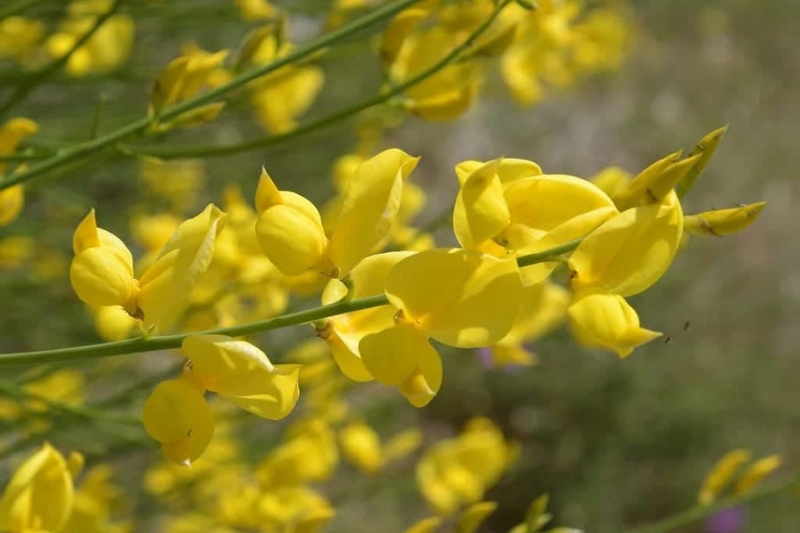 Genista, Spartium and Cytisus belong to the same family, that of fabaceae. They carry hanging pods. Some species are tapered, but most are shrubs 2m tall, deciduous and flowering butterfly-shaped mostly yellow, but sometimes white or pink. In the open soil, plant preferably in autumn, possibly in early spring, outside periods of frost. Find a sunny location in humus soil, fresh and drained, neutral or acidic. Plan to leave one and a half meters between each plant unless you want to prune it a lot later. When planting, make a hole 1/3 wider than the root ball, possibly soak the roots, plant without burying the root collar, which is the limit between roots and branches, and water copiously. In pots, plant in a mixture of garden soil and mature compost, in a large pot - 20L minimum - provided with a cup. Water and mulch. Water regularly and generously for several weeks after planting or sowing, especially if you did it late in the season. After, you only have to worry about watering if your plant is potted or in case of drought. Outside of these conditions, it will manage on its own. If you keep your broom in a pot, plan replacing the topsoil with mature compost 2 to 3 years . The brooms have a balanced habit without pruning, but to make them more compact, trim them in March by shortening the ends of the branches evenly. Brooms are often ephemeral, so we recommend harvesting seeds in late summer, storing them in a freezer bag in the refrigerator and then sowing them in the nursery in the spring, in a mixture of compost and fine earth. Renew the mulching in the fall at the foot of your broom, it will be beneficial, and highlight their flowering.